In response to claims that the NHS is being privatised under the coalition, the Prime Minister has said there's been a "tiny increase" in the proportion of NHS spending going to private providers - from 5% to 6%. Mr. Cameron is correct; private providers made up 4.9% of NHS spending in 2010/2011 and 6.1% in 2013/2014 according to figures given to us by the Department of Health. It's worth bearing in mind that the government's health reforms haven't had much time to affect the amount of spending with private providers. They only came into force in April 2013 and the 6.1% figure only refers to the following year (2013/14). 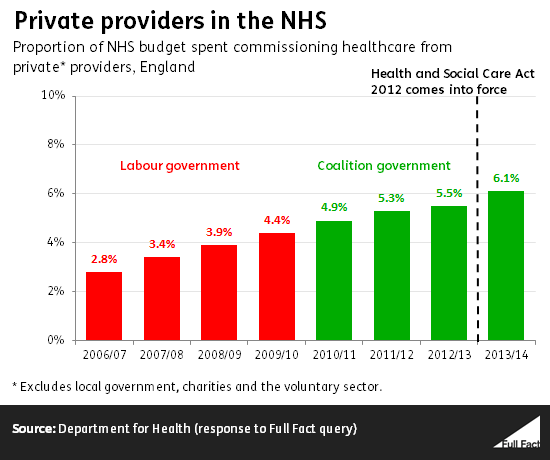 How much more is the NHS spending on private providers? Ask Full Fact: Does the World Health Organisation think the UK no longer has an NHS?